Based in Normandy France Eldim specializes in the optical analysis of angular properties of the light (in transmissive or reflective mode) with an expertise in view angle measurement and OFT Technology. 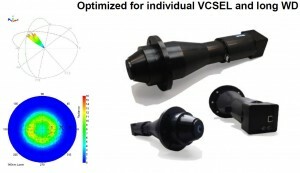 The company plans to launch at the Photonics West show 2019 two new system lines that are dedicated to near infrared view angle analysis, the OFScope-NIR & VCProbe-NIR. The OFScope-NIR (above) is ideal to measure small aperture NIR sources optimized for individual VCSEL with a working Distance of 30mm. This system can measure all kind of sources such as LIDAR, Flash LIDAR, diode Laser and VCSEL on markets like self-driving cars. This system has an angular aperture of ±40° and an excellent angular resolution, it measures in real time a full map of any NIR source. OFScope-NIR is calibrated at a wavelength of 850nm, 905nm, 940nm. The VCProbe-NIR is more suitable to measure large aperture NIR sources and is designed to precisely measure characteristics of flood illuminators, stereoscopic imaging and structured light illumination components. It is used more precisely for facial recognition. This system allows a full map within a ±70° viewing angle cone, with a working distance of 4mm permitting non-contact measurement. VCProbe-NIR is calibrated at a wavelength of 940 nm. Eldim will be present at Photonics West at the French Pavilion Moscone Convention Center – South Hall – Booths 959 & 1059. A demo of the VCProbe-NIR will also be organized with a sample of diode laser of which the measurements will be taken in real time.